Every year, shoppers look for the best deals online and in stores on Black Friday. Some shoppers stay out all night, shopping in the stores that open at midnight. Or they park themselves in front of the computer and do marathon price comparison shopping, and scan the lists of bargains listed on the Black Friday websites. But are Black Friday deals all that great? Are the prices only good on Black Friday or will the prices still be lower after the big shopping day ends? Here you will find out what is just retail hype and what isn't when it comes to bargain hunting on Black Friday. This might have been true 25 years ago when Black Friday was a bigger deal than it is today. That is not to say that there are not amazing deals on Black Friday, but many retailers kick off Black Friday sales starting the week of Thanksgiving. This is particularly true for online stores, even if their brick and mortar sister stores hold off until the big day. It might be time to break the Black Friday *only* tradition this year and check out the online stores while you are hanging out in your comfy clothes, waiting for the turkey to defrost. In 2015, Amazon had its "Eight Days of Holiday Deals" that was followed by Black Friday. They ran lightning deals every five minutes and Prime members got a 30-minute head start. Lowe's, H&M, Home Depot and Best Buy, to name just a few, kicked off Black Friday deals a few days before Thanksgiving. 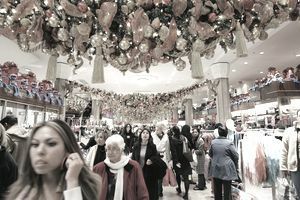 There is a lot of secrecy in retail stores during the winter holidays, especially when it comes to Black Friday prices. Retailers try to keep some of the prices of their most popular deals hidden except for their shopper's eyes only. Placing these in a Black Friday ad will alert the competition to drop their prices. Some of the smaller retailers (meaning that they aren't the giants like Walmart) do not have the ad space to advertise every hot deal. Other stores may advertise one item out of a category of items that are deeply discounted. For example, the ad may show a few pair of flannel pajamas advertised for 50 percent off, but when you get into the store, you realize that the entire sleepwear shop is 50 percent off and you just found a gorgeous Hanro gown for $30. Retailers will also advertise the items that offer them the most profit. While you may want to seek out the advertised deals, do not forget to check out the rack, shelves or tables placed nearby. There was a time that if you snoozed and left your computer, you were sure to lose some fabulous deal, but that isn't the case much anymore. There are price alert apps and browser extensions like CamelCamelCamel that will alert you to price drops on Amazon. PriceZombie will alert you of price drops from multiple stores including Amazon, Newegg, Fry's, IKEA and more. When should you stay glued to your computer? When daily deal sites like Hoot.com are having flash sales. Merchandise sells quickly, and if you see something that you want, you need to go ahead and buy it. Stores that are stocked with special purchases, such as $10 wallets will have a limited stock and the goal of the retailer is to sell out. Black Friday ads will sometimes display a Black Friday deal and how many they have in stock. While it is true that the store may only have, for example, 20 Bose headphones marked down on Black Friday, it does mean that the store will not be restocked and the price dropped again before Christmas season ends. During busy shopping seasons, the online stores experience the surge of shoppers, just like the brick and mortar stores. Inventory levels drop quickly, and prices change in a flash. All of the additional activity can cause the inventory on the websites to lag behind what is truly available in stock. Purchases are regularly processed with merchandise that is no longer in stock. When this happens, the online stores will cancel the sale, sometimes informing the shoppers through email up to three days after the sale has been processed. Cautious online shoppers will wait until they receive a confirmation the items have been shipped before throwing away their gift lists. Reminder: Avoid online shopping a few days before Christmas, even in stores that offer two-day shipping. If the sale is canceled due to your selection being out of stock, the person you were buying for may not get their gift. If you do shop online during the week of Christmas, make the purchase over the phone with a customer service representative. Retail stores that sell luxury merchandise promote Black Friday, but not always with big sale ads or promotional signage throughout the stores. Advertising is are more discreet, and many times the retailers will sponsor private sales by invitation only. Stores will often stock merchandise that they do not normally carry during the year and promote it on Black Friday. This does not mean that the items are cheap unless the store that you are shopping in usually carries cheap merchandise. National retailers and department stores aim to uphold their product standards year-round. There is a lot of hype surrounding Black Friday, but it is also when the stores kick off the holiday season with good products at low prices. There is not a retailer out there that wants to see their sales flop after Thanksgiving. A lot effort goes into bringing merchandise into the stores that the shoppers will want and at prices that will get them to buy before they leave the store. The news is in the business of captivating the attention of their viewers. One sure way to do it is to report the few negative incidents that happened on Black Friday. Any time a public place gets overcrowded, it could be a potential safety problem. One way the stores have tried to help control it is by offering different blockbuster sales throughout the day, rather than just during early bird sales. Not only is it safer for shoppers, but it is also more manageable for the employees working in the stores. When people are shopping on Black Friday or any of the weekends between Thanksgiving and Christmas, using common sense goes a long way. Not engaging in a tug of war with a stranger over a Black Friday deal is important to keeping safe. Do you have to work? Can't leave the relatives that come once every five years? That's okay. You can always find the deals online. Also, seasonal merchandise will continue to see markdowns from Thanksgiving until it sells out.